STAPLES Center is a world-class sports and entertainment venue, located at the spectacular L.A. LIVE complex in Downtown L.A. Construction of STAPLES Center broke ground on March 26, 1998, and the arena opened on October 17, 1999 with a concert by Bruce Springsteen & The E Street Band. 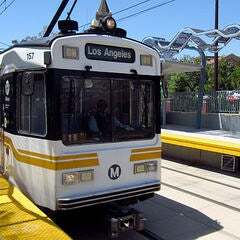 STAPLES Center is the home of four professional sports franchises: the NBA’s Los Angeles Lakers and Los Angeles Clippers, the NHL’s Los Angeles Kings and the WNBA’s Los Angeles Sparks. 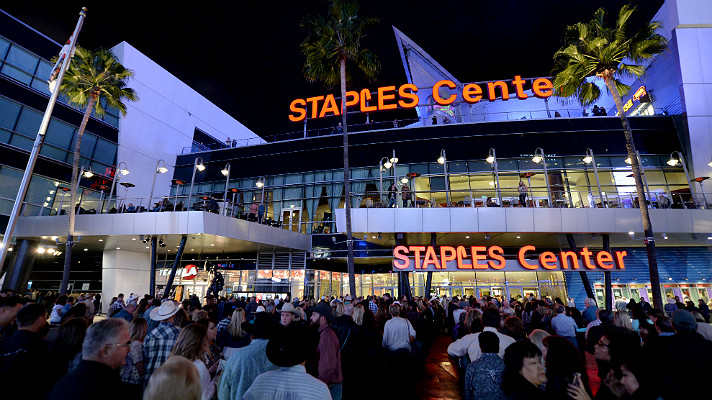 STAPLES Center hosts over 250 events and more than 4 million guests annually, with events ranging from professional sports and boxing, to the annual GRAMMY Awards, live music, and family shows. In 2012, the Los Angeles Kings won their first Stanley Cup in franchise history, defeating the New Jersey Devils 6-1 and winning the series 4-2. The Kings became the first team to win the Stanley Cup on their home ice since 2007. Kings goaltender Jonathan Quick was awarded the Conn Smythe Trophy as the Most Valuable Player of the playoffs. 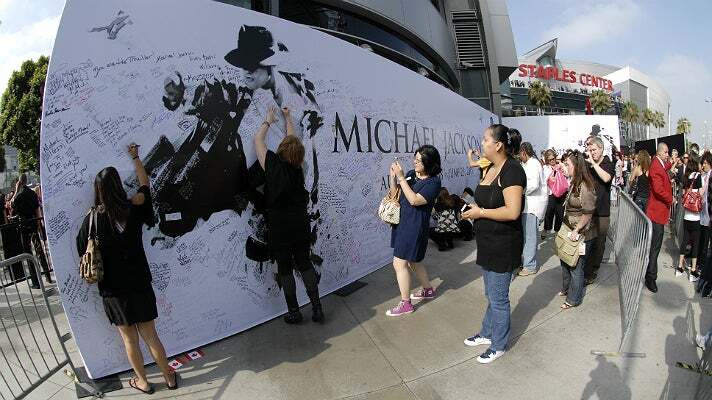 Through an online lottery, AEG gave away 17,500 free tickets to the service - over 1.2 million applications were received in 24 hours. 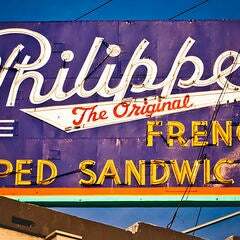 The service was broadcast live around the world. In the U.S., public screenings were held in 37 cinemas, and Nielsen reported 31 million viewers watched the service live on TV. Some news sources reported more than 2.5 billion viewers worldwide, making the event the most-watched live TV broadcast in history. 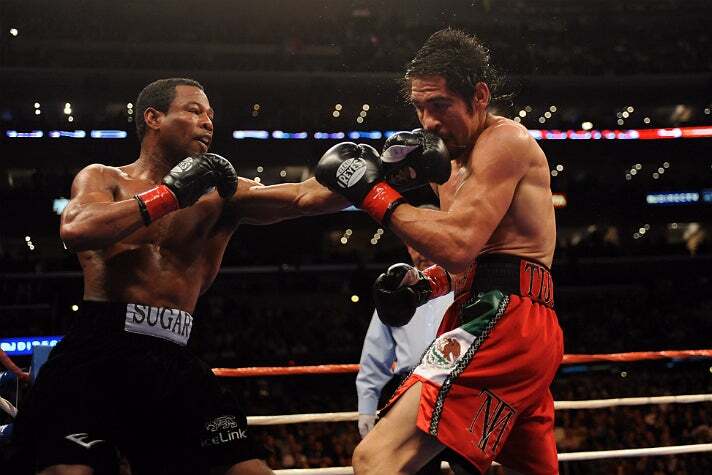 In front of a record-breaking STAPLES Center crowd of 20,820, “Sugar” Shane Mosley regained the WBA (Super) Welterweight championship from Antonio Margarito with a ninth round TKO. After the bout, the 37-year-old Mosley, who came in as a 4-1 underdog, became the #1 ranked welterweight by The Ring. With his victory, Mosley had come full circle - he first became welterweight champion in June 2000, when he defeated Oscar de la Hoya on the first-ever boxing card at STAPLES Center. 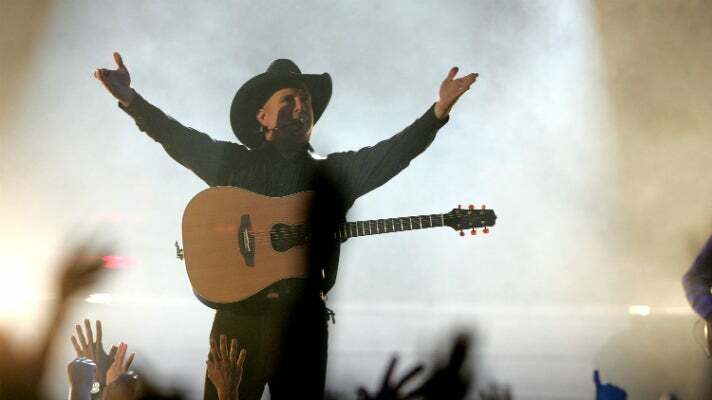 Country music superstar Garth Brooks performed an unprecedented five shows in two days to benefit firefighters and wildfire victims in Southern California. The shows sold out in less than an hour and raised over $6 million for the "Southern California 2008 Fire Relief Campaign," with proceeds distributed by the McCormick Tribune Foundation. 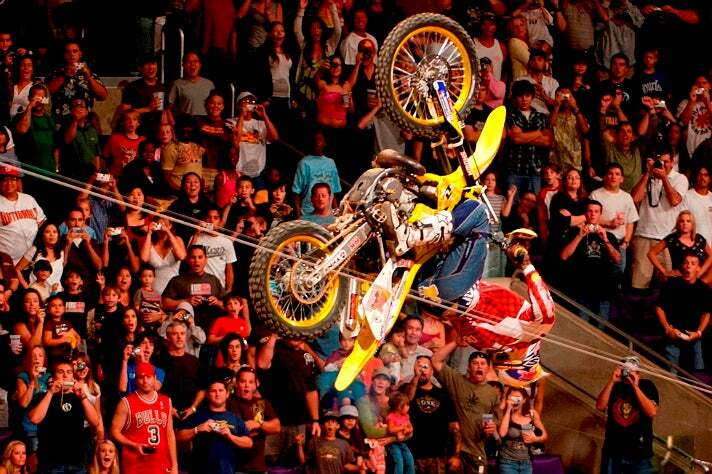 At X Games 12, Travis Pastrana landed a spectacular Double Backflip, the first one ever on a motorcycle. Pastrana scored a 98.60, the highest score in the Best Trick competition at the X Games. Pastrana became the third athlete to win three Gold Medals at a single X Games, for MotoX Best Trick, MotoX Freestyle, and Rally Car Racing. 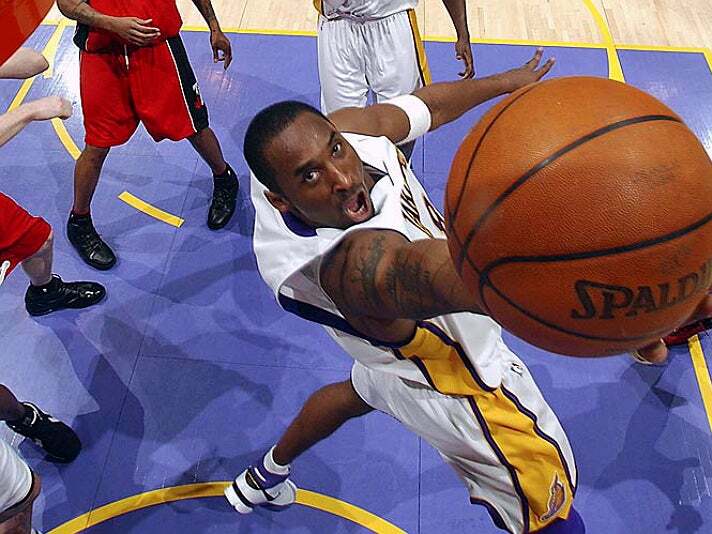 In 2006, Lakers guard Kobe Bryant scored a career-high 81 points in a victory against the Toronto Raptors. Bryant’s 81-point game is second only to Wilt Chamberlain's 100-point game in 1962. In that same month, Bryant also became the first player since 1964 to score 45 points or more in four consecutive games, joining Chamberlain and the Lakers’ Elgin Baylor as the only players ever to do so. By the end of the 2005–06 season, Bryant set Lakers single-season franchise records for most 40-point games (27) and most points scored (2,832). He won the league's scoring title for the first time, averaging 35.4 points per game. 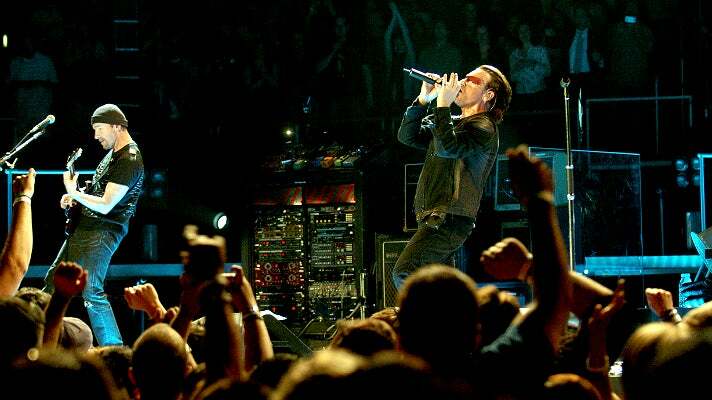 In 2005, U2 played four sold-out concerts at STAPLES Center and showed why it's one of the greatest bands in the world. Launched in support of the band’s Grammy Award-winning album, How to Dismantle an Atomic Bomb, the Vertigo Tour was the top-grossing tour of 2005. During the worldwide tour, setlists featured a wide range of songs from every U2 album, as well as rare material. At the April 6 show at STAPLES Center, U2 played The Ocean for the first time in over 22 years. At the November 1 show, the day after drummer Larry Mullen, Jr.’s birthday, U2 became “The Larry Mullen Band” for one special night. “Happy Birthday” signs were seen everywhere, as were celebrities like Charlize Theron, Don Cheadle, Salma Hayek, Dylan McDermott and Val Kilmer. WrestleMania 21 was the first one held at STAPLES Center. Tickets sold out in less than one minute, the fastest in WrestleMania history. 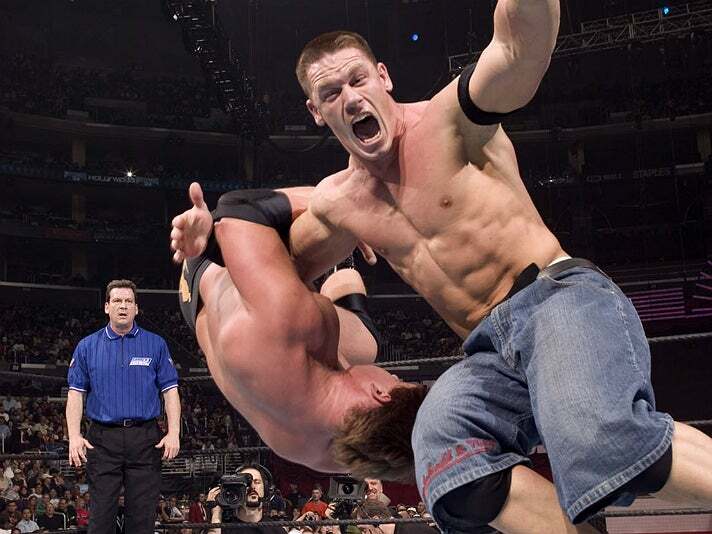 Highlights included Batista defeating Triple H to win the World Heavyweight Championship, and John Cena pinning John "Bradshaw" Layfield for the WWE Championship. 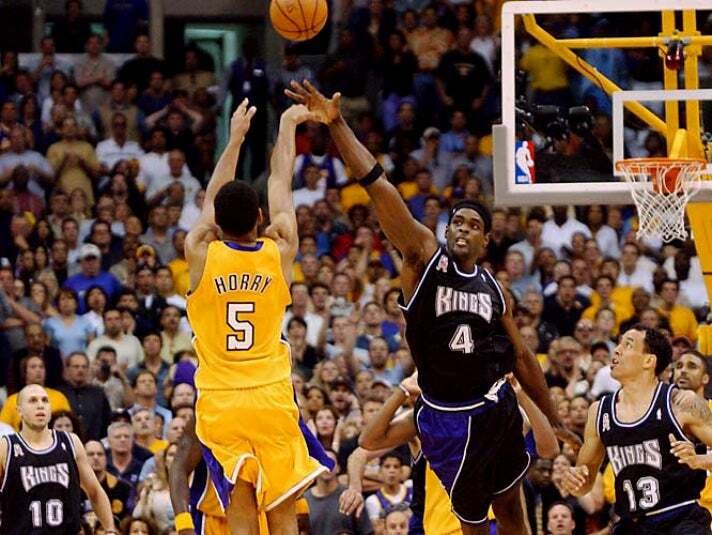 Lakers power forward Robert Horry was known for coming through in the clutch, a reputation that was secured in the waning seconds of Game 4 of the 2002 Western Conference Finals against the Sacramento Kings. Trailing 2-1 in the series and facing Game 5 in Sacramento, the Lakers were down by as many as 24 points in the first half. The Lakers cut the lead to 99–97 with 11.8 seconds to play. On the final possession, Sacramento center Vlade Divac tried to run out the clock by knocking the ball away from the basket. 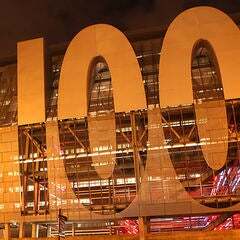 The ball bounced to Horry, who hit a three-pointer over Chris Webber at the buzzer to win the game, 100–99. The Lakers prevailed against the Kings 4-3 in the series, and went on to three-peat as NBA champions, sweeping the New Jersey Nets in the NBA finals. The alley-oops between future Hall of Famers Kobe Bryant and Shaquille O’Neal are among the most memorable in all of basketball. But the one that stands out took place at STAPLES Center in Game 7 of the 2000 Western Conference Finals. After taking a 3-1 series lead over the Portland Trail Blazers, the Lakers dropped two games in a row, setting up a winner-take-all Game 7. 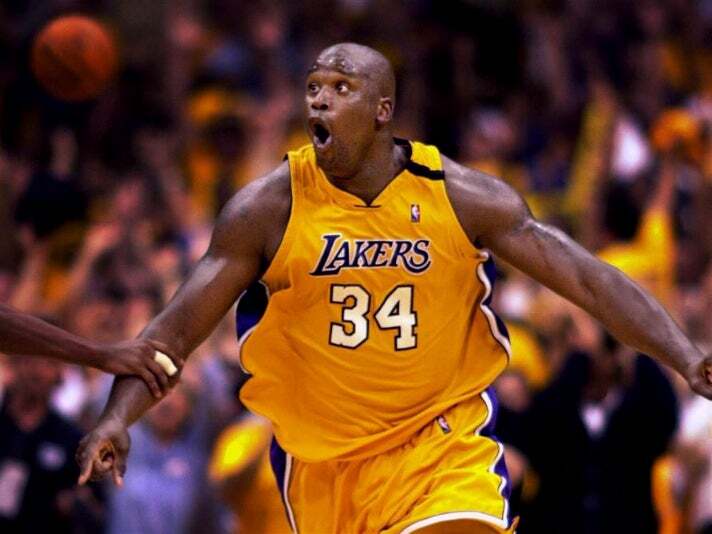 Down 75-60 with 10:28 remaining in the game, the Lakers mounted one of the greatest Game 7 comebacks in NBA history. With just over 40 seconds to play, Bryant lobbed the ball to O’Neal, who threw down a monster dunk, putting the Lakers up 85-79 and sending the crowd into pandemonium. The Lakers held on to win 89-84, and went on to defeat the Indiana Pacers 4-2 in the NBA finals, the franchise's first championship since 1988. 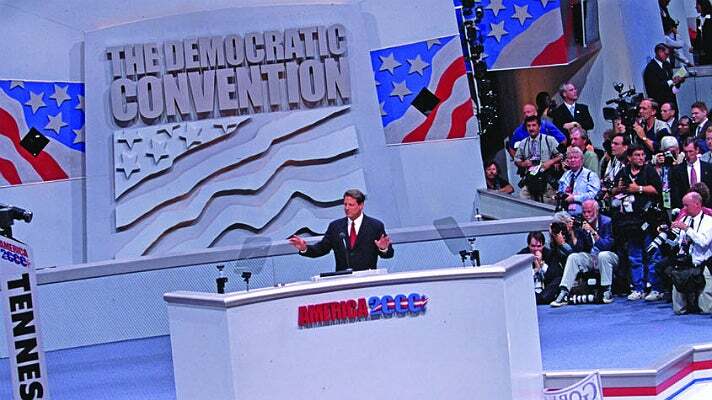 The 2000 Democratic National Convention took place at STAPLES Center from August 14 to 17. STAPLES Center was chosen as the site for the DNC over nine candidates. Notable speakers included Bill Clinton, Hillary Rodham Clinton, and Ted Kennedy. Al Gore accepted the nomination on the last night of the event. Gore’s former Harvard roommate, Tommy Lee Jones, officially nominated the Vice President.